In 1945, World War II is drawing to a close in East Prussia, and thousands of refugees are on a desperate trek toward freedom, almost all of them with something to hide. Among them are Joana, Emilia, and Florian, whose paths converge en route to the ship that promises salvation, the Wilhelm Gustloff. Forced by circumstances to unite, the three find their strength, courage, and trust one each other test with each step closer toward safety. There are only a few authors that I would pick up a book sight unseen. Ruta Sepetys is one of those authors. She tackles historical fiction in an accessible way, and it's heartbreaking. Salt to the Sea is no exception. Refugees are racing across East Prussia to escape the Soviets - their destination a harbor where German Cruise ships are waiting. Joanna is a nurse from Lithuania who is desperate to receive news of her family. Emilia is a young Polish girl harboring a horrifying secret. And Florian is an academic with a mission. The three travelers find themselves as allies as they trek through the freezing wilderness to the port in hopes of being allowed passage on one of the ships. 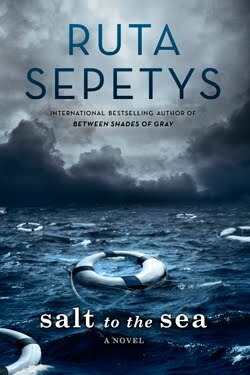 What I appreciate most about Sepetys is her research into historical events that are not common knowledge. While fictional, there is a truth at the heart of each character and the circumstances they find themselves in are truly horrifying. A history lesson and a story wrapped up in a beautiful package. It's a jumping off part that begs the hunt for additional information. Rita's stories are heavily character driven. I wanted to know SO much more about the group we meet in Salt to the Sea. Hints are dropped, context given, but I want to know these characters, and most importantly, I want to know that they're okay in the end. From page one I was cheering them on, crying at their losses, feeling their fear. And then it ended rather abruptly. My only criticism. Without given anything away, there's a bit of a skip at the end, and it took me a beat to acclimate myself to the change in direction. I probably just wanted more, which I did. But the story ended far too soon. If you haven't read Out of the Easy and Between Shades of Gray, you've got time before Salt to the Sea finally comes out in February. These are amazing reads that you should definitely enjoy.